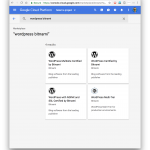 recently migrated wordpress to GCP, using cloud launcher – wordpress by bitnami. That pretty easy, google other tutorials and follow it. e.g. followed the instructions, yet those postfix setup, from fields is <username>@<hostname>, which MailJet will send a verification email to, and apparently it won’t be verified. additional steps to modified the email address, so it passes the verification. unknown reason on high CPU usage. To restart php-fpm, or the HTTP server.